Gov. Andrew Cuomo wants to spend some $400 million of that recently allocated $51 billion in federal storm aid on buying the storm-damaged homes of people who live in flood-prone areas of the coast. The plan is to leave the space open so that the next time it floods nobody’s home washes away. It’s an idea he’s been kicking around since the storm, and it still needs federal approval, so this isn’t the final plan. But this is the first time he’s made a real proposal with solid numbers. “For the 10,000 or so homes in the 100-year flood plain that were substantially damaged by Hurricane Sandy, Mr. Cuomo would offer owners the pre-storm full market value of their houses,” The New York Times reports. State officials think ten to fifteen percent of homeowners might go for it, and there would be bonuses for people in more vulnerable areas, or those who sell together as blocks. “The governor’s office said federal officials seemed receptive to their proposal,” but not everyone’s on the same page. 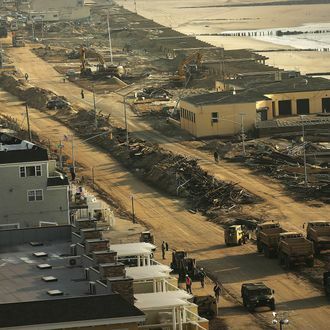 As Capital New York points out, Mayor Bloomberg and other New York City officials, not to mention coastal residents, have showed much more support for rebuilding than retreating.